All has been quiet on the blog front hasn't it? I haven’t come up with anything to write about, even though a lot has happened. I think actually I've been a little overwhelmed after deciding to remove the 1960's cement fiber siding off the house, revealing the 1920's clapboard. It was certainly not a necessary thing to undertake and once the work started I realised (again) how taking on a task is never as simple as it seems and inevitably leads to many more tasks. The original siding is in great condition but the work ahead; power-washing, scraping, pulling nails, filling holes, priming, staining, staining again, cutting and staining and fitting trim pieces, all of this looms. Throw into this mix the skills and personalities needed to get the job done, the schedule of work, the weather and when all is said and done you stand back and ask, "was it worth it?". Time will tell but blimey I hope so. 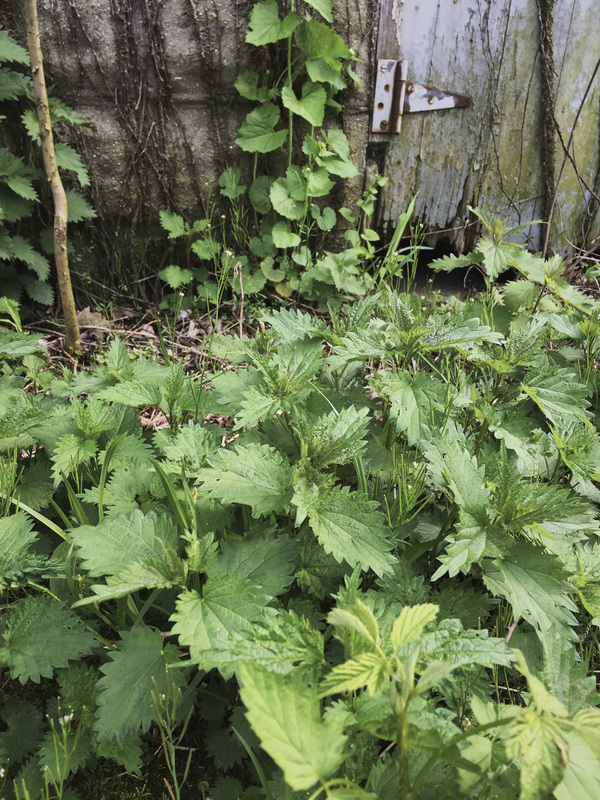 Of my childhood memories, blackberry picking and nettle rash went hand in hand. It was an essential part of the experience of our holiday and more than that, it was needed for the crumble. Mummy would make blackberry apple crumble and we'd eat it hot out of the oven, covered in silky scorching Birds custard in the middle of August, when England in the middle of August was predictably scorching as custard. A good friend tells me that my younger years spent in nettle patches says everything about me and he may be correct. My trials with Parchment House a case in point perhaps but also not forgetting a few past relationships, all suggesting a moderately masochistic streak in me. But I am getting distracted. So, last Friday, with the perfect sun and a good few days behind me, I was determined to go pick nettles, the impetus to make pesto for a pasta supper and also the promise of a bag of them to the chef at my favourite Chicago restaurant. After research I learn to only cut the first 3 bracts and so this is what I do. It’s quick work and all the while I am brushing aside the bugs and watching the bumble bees and butterflies. It's an engrossing activity, one which gets you close to the ground and at which point you start to notice the smaller details. As I moved slowly, cutting and day dreaming, my eyes focused in on something I could barely contain my joy about; morels! Well, actually just 2 of them but still, I have morels on my property. I was giddy with triumph, even though I hadn't actually done anything. As I knelt down to take some photographs of my prize, my bare knees sank deep into a pile of nettles. That fiery pain and the red welts that followed were testimony to my feeling of joy, pure and simple. Me, a masochist, what do you think? Wash nettles thoroughly wearing gloves. Blanch them in boiling water for a few seconds then shock in ice water. They can now be handled without gloves. Remove all the leaves from the stalks. Then use a clean dish towel to squeeze out as much liquid as possible. You'll have a tight dryish clump of leaves at the end of this. Put in a food processor along with the other ingredients except the oil. Pulse a few times to amalgamate then start to drizzle the oil slowly in, pulsing as you go, until you get to a consistency you like. Serve with your favourite pasta, as a sauce for lamb chops, a dressing for potato salad, spread on fresh bread with a ripe tomato and anything else you can dream up. You can also freeze it in ice cube trays, which will take the sting out of the prep of a mid-week meal.